Deere’s “legacy” Build Your Own experience dated back to the early 2000’s. The need was over a decade overdue. 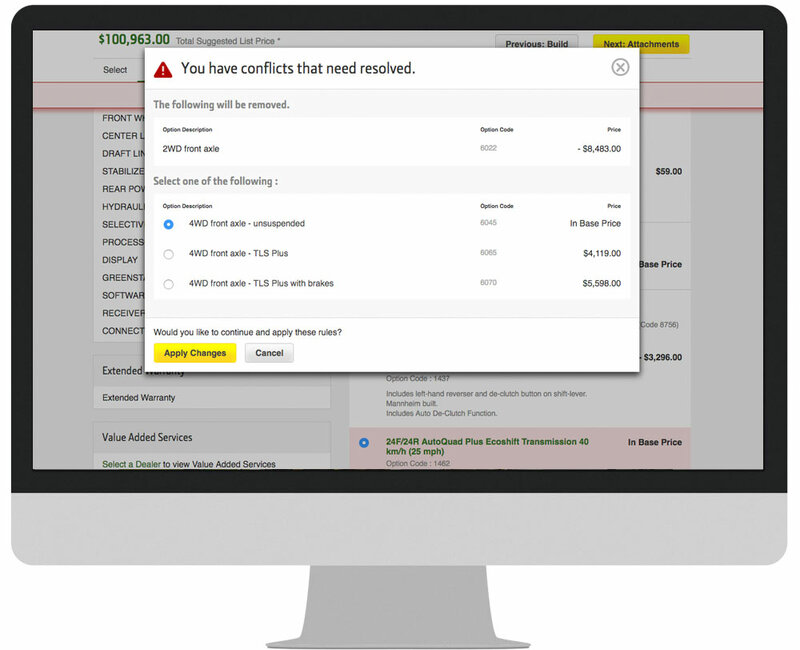 Fully redesigned Build-and-Price experience, with a step-by-step flow for every product in the Deere catalog. Goal: to send a direct quote, with all options and accessories, to a nearby dealer, improving the conversion funnel. The timeline, and development budget, was very tight. Extensive conflict-resolution was needed: every configuration seemed to have at least one conflict or “incomplete” selection. Some deep-diving on subject matter expertise on the process of building and configuring various categories of products. Since the solution was in some ways narrow, but required a seamless user flow, we conducted various research and facilitation methods to ensure the approach was compatible with the mental models of our user categories. From there, extensive sketching and design iterations.